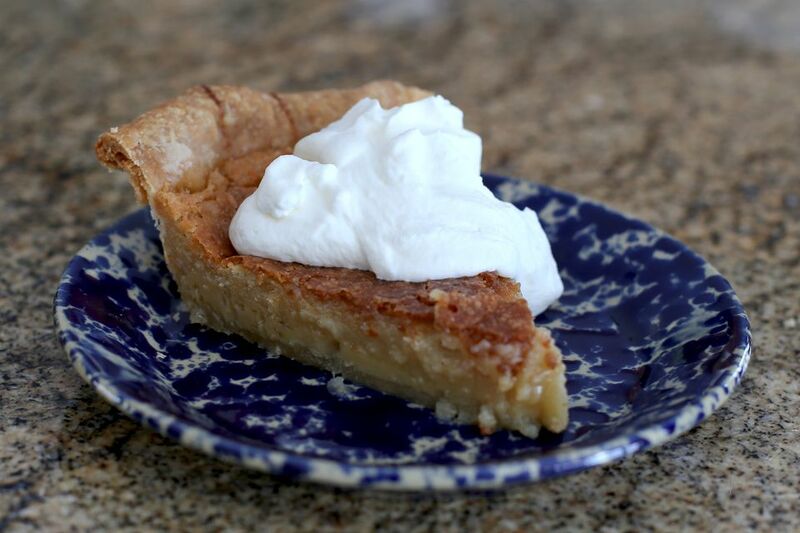 This transparent pie is similar to a chess pie or sugar pie, and it is a Kentucky tradition. This version of the pie is made with half brown sugar and half granulated sugar. Many of Kentucky's pies feature bourbon, one of their most famous exports. The bourbon pecan pie is always a hit! The simple combination of ingredients makes a filling to die for! Chill the pie and serve it with freshly whipped cream. If you choose to use a pre-made frozen crust or refrigerated pastry, follow the instructions for partially baking the pie shell. Even though you can bake the pie with an unbaked crust, a par-baked crust is recommended to avoid a soggy bottom. In a food processor pulse the flour, salt, and sugar until well blended. Add half of the butter and pulse about 6 times. Add the remaining butter and pulse 5 or 6 times. The mixture should look crumbly with pea-sized pieces here and there. Sprinkle a few tablespoons of ice water over the flour mixture and pulse a few times. Add more ice water, a teaspoon at a time, until the mixture begins to form small clumps. Dump the mixture out onto a floured surface and press and shape with your hands until the dough holds together. Don't overwork the dough. Shape it into a flat disc, wrap in plastic wrap, and refrigerate for 30 to 45 minutes. Heat the oven to 450 F (230 C/Gas 8). Roll the chilled dough out about 2 inches bigger than the pie plate (upside-down). Fit it into the pie plate and crimp the edge as desired. Line the pie shell (do not prick the dough) with foil and fill with pie weights or dried beans. Bake the pie shell for 8 minutes. Remove the foil and pie weights, return it to the oven, and bake for another 3 minutes. Remove the crust to a baking sheet and reduce the oven temperature to 350 F (180 C/Gas 4). In a medium mixing bowl, whisk the eggs. Add the sugar, flour, melted butter, cream, salt, and vanilla. Blend well. Pour the filling mixture into the crust. Place a pie shield over the crust edge to prevent excessive browning. Transfer the pie to the 350 F oven (baking sheet and all) and bake for 35 minutes. Remove the pie shield and continue baking for 10 to 15 minutes, or until set. Cool on a rack and then chill thoroughly before serving.